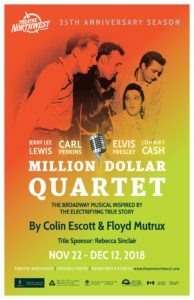 This Tony nominated musical tells the true story of a meeting on December 4, 1956 at Sun Records. Producer Sam Phillips brought together Elvis Presley, Jerry Lee Lewis, Johnny Cash and Carl Perkins to the studio to hang out and jam their favourite songs together. Four of rock and roll’s greatest on the stage at one time in a live experience you will never forget that made rock ‘n’ roll history! Featuring iconic hits like “Hound Dog, “Blue Suede Shoes”, “Folsom Prison Blues”, “That’s All Right”, “Great Balls of Fire”, and a whole lot more!